The Sociological Journal’ is an independent professional oriented magazine for sociologists founded in 1994 by professor Gennady S. Batygin (1951‑2003). The magazine was officially established by the Institute of Sociology of the Russian Academy of Sciences. The Journal is peer refereed and has been included into the list of the periodicals validated by the Higher Attestation Committee of the Russian Federation to publish the research results of doctorial and candidate dissertations on sociology. The Journal represents the interests of the scientific and educational community. It is being published at the expense of the sponsors and research foundations. Currently ‘The Sociological Journal’ is one of the most popular magazines among the professional sociologists in Russia. Our Journal’s goal is to develop fundamental sociology, to reproduce the international standards of sociological knowledge, the standards of professional community self-verification and also to participate in the process of renovation of Russian sociological education while sustaining professional communication in the social sciences, humanities and sociological education in Russia and abroad. The Editorial Board of ‘The Sociological Journal’ operates in accordance with the norms and international standards set by Committee on Publication Ethics (COPE) (http://publicationethics.org/files/Code_of_conduct_for_journal_editors_Mar11.pdf). ‘The Sociological Journal’ publishes articles on various social sciences and related disciplines such as social psychology, cultural studies, anthropology and ethnography. Interdisciplinary approach is welcomed and encouraged. The Journal is focused on fundamental research, theory, methodology and history of sociology. The results of mass surveys and monographs are highlighted in a regular column. The controversial issues of sociology are being discussed in ‘The Discussion’ rubric. 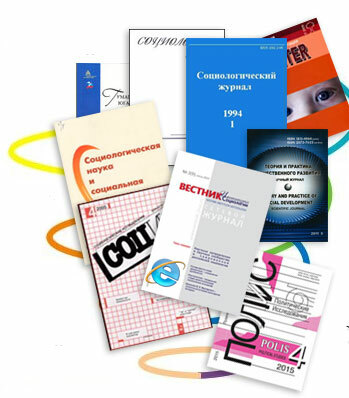 The Journal publishes reviews, essays and reviews, as well as lists of new books in Russian and English languages which represent the main tendencies of interdisciplinary research in the social sciences. ‘The Sociological Journal’ is distributed by subscription, mailed to the Russian university libraries and university departments of social sciences for free and also is available on the free market. The Journal is registered in the leading bibliographic catalogs and the citation databases. The Journal’s goal is not only to reproduce the normative patterns of knowledge and the norms of professional self-examination, but also to improve them. Therefore the rules of selection of the new texts are very strict so only the best articles have chance to be published. Following these rules allows ‘The Sociological Journal’ to contribute in development of the social sciences. The editorial staff of ‘The Sociological Journal" is composed of the employees of the Sector of sociology of science, Institute of Sociology of the Russian Academy of Sciences. Editorial address: 117218 Moscow, Krzhizhanovskogo 24/35, Building 5, Room. 419. Fax: +7 (495) 719 07 40.